Biomarkers have resulted from breakthrough treatments and, in turn, provide targets for more breakthroughs. The value of a biomarker is in its ability to predict or be a surrogate for a clinical state of a patient. In this review we take the approach of how various biomarkers span multiple domains to define a clinical state in patients with multiple sclerosis (MS). Viewed in this manner, the value of various biomarkers in understanding the patient with MS becomes evident. 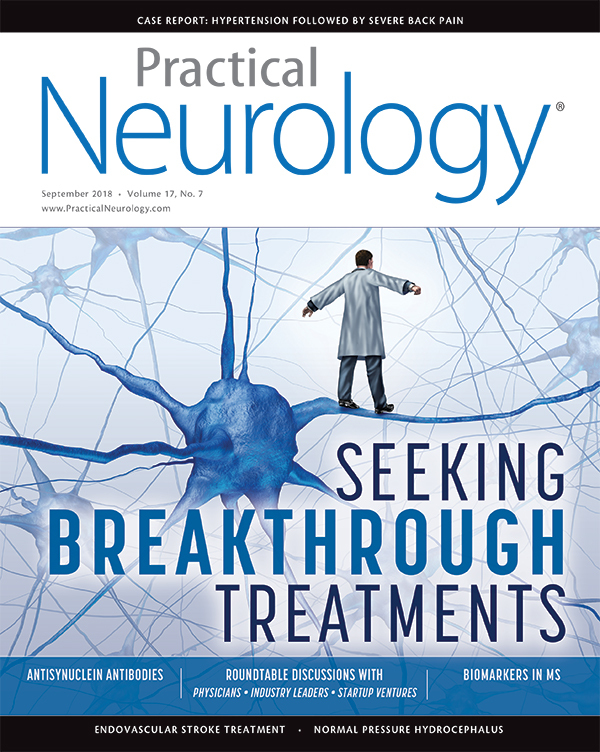 One of the best recent examples that has revolutionized patient care is the discovery of aquaporin 4 antibodies that show neuromyelitis optica spectrum disorder (NMOSD) is a different entity from MS.2 Treating patients with NMOSD with disease-modifying treatments (DMTs) approved for treatment of patients with MS can have disastrous consequences and should be avoided. Early diagnosis and treatment of patients with MS can alter disease course and slow disability progression. The need to improve diagnosis for initiation of these breakthrough treatments and to monitor patients’ responses to treatment have led to advances in biomarkers in MS. In turn, these biomarkers sometimes become new targets for more potential breakthrough treatments. The search for a reliable biomarker to predict disease progression and monitor response to therapy remains a challenge. Several biomarkers including MRI, blood and CSF markers, and optical coherence tomography (OCT) are promising in this regard. 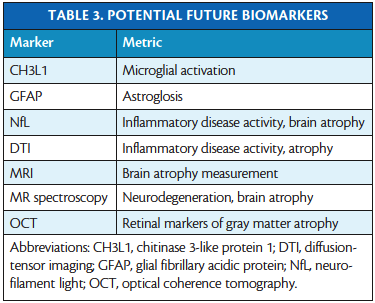 We focus on biomarkers that are reliable tools for diagnosis and monitoring patients with MS in clinical practice (Table 1) and briefly summarize potential future biomarkers. Use of the JCV index is among the best examples of biomarker used to guide choice of a specific therapy in patients with MS and is an invaluable tool in monitoring this potentially hazardous drug. Approximately 40% of patients who take interferon β (IFN-β) generate neutralizing antibodies (NAbs) after 12 to 18 months, which may lead to reduced response.9,10 Production of NAbs is lowest with intramuscular IFN-β-1a and highest with subcutaneous IFN-β-1b. Because there is cross-reactivity to different formulations of IFN-β, a patient with NAbs should be switched to a nonIFN-β DMT. Patients treated with natalizumab infrequently develop NAbs to natalizumab (4%-12% of patients), typically within 3 months of starting treatment.10 Here too, a patient should be switched to another therapy if NAbs are detected. Ocrelizumab, approved for treatment of patients with relapsing and primary-progressive MS and rituximab, used off-label for treating patients with MS, both target the CD20 antigen, found on pre-B cells, mature, and memory B cells, but not on lymphoid stem cells and plasma cells. Cells expressing CD19 have a similar expression profile as cells expressing CD20, and peripheral CD19 lymphocyte count is used as a surrogate marker to monitor treatment efficacy of ocrelizumab and rituximab. The time frame for restoration of the B-cell population that is depleted after a single course of rituximab or ocrelizumab is variable and therefore, so is the dose interval.11 Blood count of CD19 lymphocytes can potentially be a useful marker to guide optimal dosing interval and minimize unnecessary exposure to these extensive therapies with serious potential toxicity from long-term exposure. Probably the best MRI correlate for disease progression is annual loss of brain volume, which is 0.5% to 1.5% in persons with MS29 compared to 0.1% to 0.5% in persons without MS.30 Brain volume is the sum total of many competing changes that occur during pathogenesis of MS, which include expansion during acute inflammation, loss of volume after treatment with DMTs termed pseudoatrophy, and most importantly, further loss from gliosis and neuroaxonal loss. Regional brain-volume loss may be a useful marker of specific impairments; thalamic-volume loss has been correlated with cognitive impairment, depression, and fatigue.31,32 Measurement of atrophy in routine patient care is not yet feasible, in part because of the large postprocessing needed to make such measurements meaningful. Probably one of the greatest breakthroughs in recent times has been the ability to image brain at ultra-high fields of 7 T or 8 T. Although FDA-approved, this technology has not entered routine use yet.38 The signal-to-noise ratio is vastly improved as is spatial resolution but level of artifacts is high, and the spine and posterior fossa cannot be imaged. Cortical lesions of MS can be imaged at a microscopic level with 8 T MRI.39 The utility of imaging at 8 T may be in the ability to image and measure nonproton compounds like iron or phosphorus. The presence of iron in MS lesions is a marker of microglial activity, and quantitative susceptibility mapping (QSM) that can now be done at 3 T can probably be better done at 8 T. The study of iron in MS lesions may be important in the longitudinal assessment of progression in MS. The degree of RNFL thinning also correlates with MRI measures of brain atrophy and with physical and cognitive disability in patients with MS.41 Specifically, GCIP atrophy correlates with gray matter atrophy, especially in patients with progressive MS, reflecting underlying disease progression. Glial fibrillary acidic protein (GFAP) is a major cytoskeleton protein of astrocytes that can be measured in the CSF, reflecting the rate of astrogliosis, and may be a potential biomarker for disease progression and the effect of DMT. Levels of GFAP seem to be a useful biomarker for highly active acute inflammation in patients with relapsing-remitting MS and those with CIS.48 Levels of GFAP in CSF predicted future disability in a study in which NfL levels had shown no relationship to disability or disease progression. Biomarker discovery is an area of unmet need and MRI-guided therapy has become the standard of care. Increased utility of this modality can be expected in the future with improved technology and decreasing costs. Markers in body fluid will complement imaging, especially serum markers because frequent sampling of CSF, although desirable is simply not practical. In this regard, examination of NfL shows great promise since serum levels of NfL correlated well with CSF levels. Improved understanding of the pathogenesis of MS affords not only opportunities for early intervention with treatment modalities but also the opportunities to develop better and meaningful markers of inflammation, injury, and most of all, repair. 1. FDA-NIH Biomarker Working Group. BEST (Biomarkers, EndpointS, and other Tools) Resource [Internet]. Silver Spring (MD): Food and Drug Administration (US); 2016-. https://www.ncbi.nlm.nih.gov/books/NBK326791/ Co-published by National Institutes of Health (US), Bethesda (MD). Accessed August 24, 2018. 2. Lennon VA, Kryzer TJ, Pittock SJ, Verkman AS, Hinson SR. IgG marker of optic-spinal multiple sclerosis binds to the aquaporin-4 water channel. J Exp Med. 2005;202(4):473-477. 3. Thompson AJ, Banwell BL, Barkhof F, et al. Diagnosis of multiple sclerosis: 2017 revisions of the McDonald criteria. Lancet Neurol. 2018;17(2):162-173. 4. Okuda DT, Siva A, Kantarci O, et al. Radiologically isolated syndrome: 5-year risk for an initial clinical event. PLoS One. 2014;9(3):e90509. 5. Rammohan KW. Cerebrospinal fluid in multiple sclerosis. Ann Indian Acad Neurol. 2009;12(4):246-253. 6. Dobson R, Ramagopalan S, Davis A, Giovannoni G. Cerebrospinal fluid oligoclonal bands in multiple sclerosis and clinically isolated syndromes: ameta-analysis of prevalence, prognosis and effect of latitude. J Neurol Neurosurg Psychiatry. 2013;84(8):909-914. 7. Tysabri [package insert]. Biogen Inc. Cambridge, MA. 8. Berger JR, Houff SA, Gurwell J, Vega N, Miller CS, Danaher RJ. JC virus antibody status underestimates infection rates. Ann Neurol. 2013;74(1):84-90. 9. Sorensen PS. Neutralizing antibodies against interferon-beta. Ther Adv Neurol Disord. 2008;1(2):125-141. 10. Deisenhammer F. Neutralizing antibodies to interferon-beta and other immunological treatments for multiple sclerosis: Prevalence and impact on outcomes. CNS Drugs. 2009;23(5):379-396. 11. Kappos L, Li D, Calabresi PA, et al. Ocrelizumab in relapsing-remitting multiple sclerosis: a phase 2, randomised, placebo-controlled, multicentre trial. Lancet. 2011;378:1779-1787. 12. Imrell K, Greiner E, Hillert J, Masterman T. HLA-DRB115 and cerebrospinal-fluid-specific oligoclonal immunoglobulin G bands lower age at attainment of important disease milestones in multiple sclerosis. J Neuroimmunol. 2009;210:128-130. 13. Lysandropoulos AP, Mavroudakis N, Pandolfo M, et al. HLA genotype as a marker of multiple sclerosis prognosis: a pilot study. J Neurol Sci. 2017;375:348-354. 14. Isobe N, Gourraud PA, Harbo HF, et al. Genetic risk variants in African Americans with multiple sclerosis. Neurology. 2013;81:219-227. 15. Farina G, Magliozzi R, Pitteri M, et al. Increased cortical lesion load and intrathecal inflammation is associated with oligoclonal bands in multiple sclerosis patients: a combined CSF and MRI study. J Neuroinflammation. 2017;14(1):40. 16. Labiano-Fontcuberta A, Mato-Abad V, Alvarez-Linera J, et al. Gray matter involvement in radiologically isolated syndrome. Medicine (Baltimore). 2016;95(13):e3208. 17. Zivadinov R, Havrdova E, Bergsland N, et al. Thalamic atrophy is associated with development of clinically definite multiple sclerosis. Radiology. 2013;268(3):831-841. 18. Schlaeger R, Papinutto N, Panara V, et al. Spinal cord gray matter atrophy correlates with multiple sclerosis disability. Ann Neurol. 2014;76(4):568-580. 19. Calabrese M, Agosta F, Rinaldi F, et al. Cortical lesions and atrophy associated with cognitive impairment in relapsing-remitting multiple sclerosis. Arch Neurol. 2009;66(9):1144-1150. 20. Tomassini V, Paolillo A, Russo P, et al. Predictors of long-term clinical response to interferon beta therapy in relapsing multiple sclerosis. J Neurol. 2006;253(3):287-293. 21. Rio J, Castillo J, Rovira A, et al. Measures in the first year of therapy predict the response to interferon beta in MS. Mult Scler. 2009;15(7):848-853. 22. Durelli L, Barbero P, Bergui M, et al. MRI activity and neutralising antibody as predictors of response to interferon beta treatment in multiple sclerosis. J Neurol Neurosurg Psychiatry. 2008;79(6):646-651. 23. Bermel RA, You X, Foulds P, et al. Predictors of long-term outcome in multiple sclerosis patients treated with interferon beta. Ann Neurol. 2013;73(1):95-103. 24. Rudick RA, Lee JC, Simon J, Ransohoff RM, Fisher E. Defining interferon beta response status in multiple sclerosis patients. Ann Neurol. 2004;56(4):548-555. 25. Kaunzner UW, Gauthier SA. MRI in the assessment and monitoring of multiple sclerosis: an update on best practice. Ther Adv Neurol Disord. 2017;10(6):247-261. 26. University of California, San Francisco MS-EPIC Team:, Cree BA, Gourraud PA, et al. Long-term evolution of multiple sclerosis disability in the treatment era. Ann Neurol. 2016;80(4):499-510. 27. O’Riordan JI, Thompson AJ, Kingsley DP, et al. The prognostic value of brain MRI in clinically isolated syndromes of the CNS. A 10-year follow-up. Brain. 1998;121(Pt 3):495-503. 28. Brex PA, Ciccarelli O, O’Riordan JI, Sailer M, Thompson AJ, Miller DH. A longitudinal study of abnormalities on MRI and disability from multiple sclerosis. N Engl J Med. 2002;346(3):158-164. 29. Vagberg M, Lindqvist T, Ambarki K, et al. Automated determination of brain parenchymal fraction in multiple sclerosis. AJNR Am J Neuroradiol. 2013;34(3):498-504. 30. Fjell AM, Walhovd KB, Fennema-Notestine C, et al. One-year brain atrophy evident in healthy aging. J Neurosci. 2009;29(48):15223-15231. 31. Debernard L, Melzer TR, Alla S, et al. Deep grey matter MRI abnormalities and cognitive function in relapsing-remitting multiple sclerosis. Psychiatry Res. 2015;234(3):352-361. 32. Wilting J, Rolfsnes HO, Zimmermann H, et al. Structural correlates for fatigue in early relapsing remitting multiple sclerosis. Eur Radiol. 2016;26(2):515-523. 33. Llufriu S, Kornak J, Ratiney H, et al. Magnetic resonance spectroscopy markers of disease progression in multiple sclerosis. JAMA Neurol. 2014;71(7):840-847. 34. Aung WY, Mar S, Benzinger TL. Diffusion tensor MRI as a biomarker in axonal and myelin damage. Imaging Med. 2013;5(5):427-440. 35. Tae WS, Ham BJ, Pyun SB, Kang SH, Kim BJ. 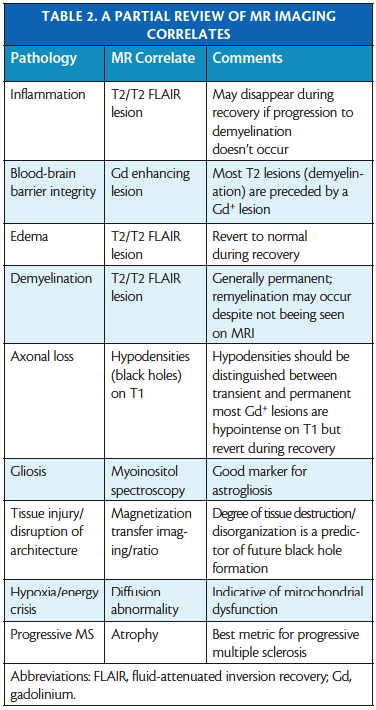 Current clinical applications of diffusion-tensor imaging in neurological disorders. J Clin Neurol. 2018;14:129-140. 36. Temel S, Keklikoglu HD, Vural G, Deniz O, Ercan K. Diffusion tensor magnetic resonance imaging in patients with multiple sclerosis and its relationship with disability. Neuroradiol J. 2013;26(1):3-17. 37. Klistorner A, Wang C, Fofanova V, et al. Diffusivity in multiple sclerosis lesions: at the cutting edge? Neuroimage Clin. 2016;12:219-226. 38. Atkinson IC, Renteria L, Burd H, Pliskin NH, Thulborn KR. Safety of human MRI at static fields above the FDA 8 T guideline: sodium imaging at 9.4 T does not affect vital signs or cognitive ability. J Magn Reson Imaging. 2007;26(5):1222-1227. 39. Kangarlu A, Bourekas EC, Ray-Chaudhury A, Rammohan KW. Cerebral cortical lesions in multiple sclerosis detected by MR imaging at 8 tesla. AJNR Am J Neuroradiol. 2007;28(2):262-266. 40. Yaqoob Z, Wu J, Yang C. Spectral domain optical coherence tomography: a better OCT imaging strategy. BioTechniques. 2005;39:S6-13. 41. Costello F, Burton JM. Retinal imaging with optical coherence tomography: a biomarker in multiple sclerosis? Eye Brain. 2018;10:47-63. 42. Petzold A. Neurofilament phosphoforms: surrogate markers for axonal injury, degeneration and loss. J Neurol Sci. 2005;233(1-2):183-198. 43. Hakansson I, Tisell A, Cassel P, et al. Neurofilament light chain in cerebrospinal fluid and prediction of disease activity in clinically isolated syndrome and relapsing-remitting multiple sclerosis. Eur J Neurol. 2017;24(5):703-712. 44. Disanto G, Barro C, Benkert P, et al. Serum neurofilament light: a biomarker of neuronal damage in multiple sclerosis. Ann Neurol. 2017;81(6):857-870. 45. Varhaug KN, Barro C, Bjornevik K, et al. Neurofilament light chain predicts disease activity in relapsing-remitting MS. Neurol Neuroimmunol Neuroinflamm. 2017;5(1):e422. 46. Kuhle J, Disanto G, Lorscheider J, et al. Fingolimod and CSF neurofilament light chain levels in relapsing-remitting multiple sclerosis. Neurology. 2015;84(16):1639-1643. 47. Hakansson I, Tisell A, Cassel P, et al. Neurofilament light chain in cerebrospinal fluid and prediction of disease activity in clinically isolated syndrome and relapsing-remitting multiple sclerosis. Eur J Neurol. 2017;24(5):703-712. 48. Kassubek R, Gorges M, Schocke M, et al. GFAP in early multiple sclerosis: a biomarker for inflammation. Neurosci Lett. 2017;657:166-170. 49. Hinsinger G, Galeotti N, Nabholz N, et al. Chitinase 3-like proteins as diagnostic and prognostic biomarkers of multiple sclerosis. Mult Scler. 2015;21(10):1251-1261.